I am simply a CONDUIT. Pure and simple, in everything I do that really matters, I am the vehicle that allows the energy to come through; I am the vessel that holds the energy during the creative process. It flows, and overflows, as long as I get out of the way and allow it. It doesn't really matter what you choose to call this perfect healing energy: God, Source, Spirit or something denominational. The important revelation for me came with the understanding that it is this pure Source energy that unites each and every one of us, and creates our connection to God, and to our soul. You will notice that I have several different galleries of my work. In each, you will discover something slightly different; but a common thread that exists throughout each body of work is that I strive to create works that discover magic in the ordinary, blend reality with the impossible, and explore the boundaries of the mind and human experience. With each drawing, I invite the viewer to join me in a celebration of the lines and patterns that make up all living things. For me, this continuity and repetition reflect an underlying theme that I feel called upon to share -- the idea that we are all ONE. The act of creation is very meditative for me, and I discover something new with each piece. Each of my pieces can be experienced on many levels. It’s up to you: view what it says on the surface or delve much deeper. There is always something more I am trying to say. 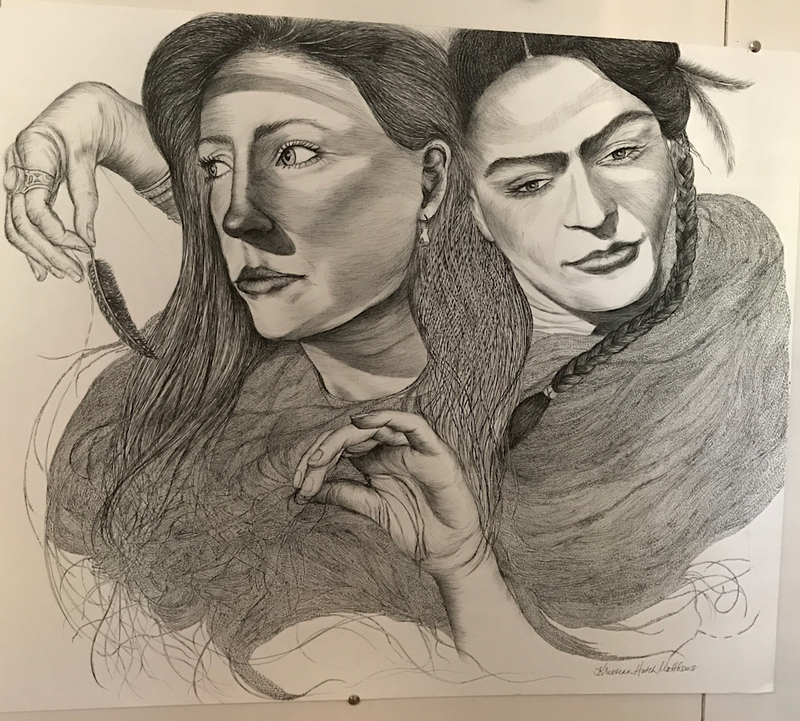 "Frida and Me" a self-portrait inspired by a visitation dream with Frida Kahlo. I own and create out of the RepARTee Gallery in the Penfield Arts Center, in Penfield, NY. Because the act of creation is so therapeutic for me, I love to assist and inspire others in igniting their own creative fires and finding alignment, balance, and wholeness in their daily living. I offer a variety of courses in 'Conscious Creativity,’ at the Penfield Arts Center in Penfield, NY. ‘Conscious creativity’ is how I refer to the wonderful process of connecting to Source energy and allowing it to flow through us into tangible form. Although the resulting creations will be unique to each individual, the common thread is the use of creativity as a technique to discover the authentic self, reconnect with spirit, and step “up and into” one’s soul purpose. There is a meditative component that differentiates this approach from traditional art instruction, as well as a significant emphasis on listening to the messages that come during dreamtime. I've found that this work on understanding oneself can be really playful and fun. The biggest benefit: it is extremely therapeutic. As we release elements from our unconscious into consciousness, we recharge ourselves with all the energy that it once took to suppress the truth. I am committed to this quest for authenticity, both as an individual, and for the culture at large. Another large part of my work is a devotion to balancing the masculine and feminine energies, as they exist within and around all of us, and to understand and communicate the positive impact this can have on our world. I have been working to inspire dialogue and revise the way we view relationships and our patterns of relating to others since the publication of my wordless picture book The Cat Flap: A Tale of Harmony and Balance in 2014. I love it when I can use my art, or my literature, to open up discussion and create space for new, more harmonious, unconditionally loving interactions to occur between people who come from different -- even polarized -- perspectives.